Viewside Lodge was constructed in 1959 to replace a large Victorian villa. 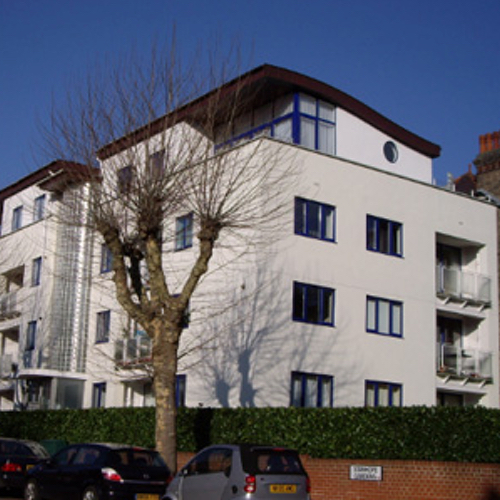 It was a flat roofed three storey residential block of nine two bedroom Flats and had been 'maintained' only and no improvement work had been carried out since it was constructed. The flat roof covering was at the end of its life, despite being patch repaired for many years. The windows were single glazed, draughty and did not fit correctly. The brickwork was aesthetically poor and patched because of previous crack repairs. Boiler flues were projecting in differing positions. The common parts were tired with worn finishes and poor lighting. Fire escape provisions were inadequate. Main services were unable to cope with the increased demand created by modern living. Pirton Limited added one extra floor of two penthouses under a curved copper covered roof. In addition to constructing the new apartments we refurbished the existing building by replacing all windows and doors with new in double glazed powder coated aluminium, upgraded the common parts, improved services and carried out landscaping.